The United States Mint has announced the pricing for 2008 American Eagle Gold Uncirculated collector coins and their release date of April 1st. 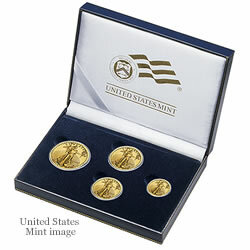 The U.S. Mint began production of the American Eagle Gold coins in 1986. 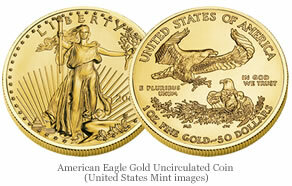 However, these uncirculated coins are the newer collectible versions of the popular American Eagle bullion coins. They were first offered in 2006 and bear the “W” mint mark to indicate they were minted at the Mint’s West Point facility. The coin’s obverse or heads design features Augustus Saint-Gaudens’ famed image of the full-length figure of Liberty with flowing hair, holding a torch in one hand and an olive branch in the other. The reverse or tails design by sculptor Miley Busiek depicts a male eagle carrying an olive branch flying above a nest containing a female eagle and her eaglets. Each coin comes within a protective presentation case and a Certificate of Authenticity signed by the current Director of the United States Mint, Edmund C. Moy. Starting in 2007, the U.S. Mint suspended certain bullion coin sales to readjust their prices due to changing gold and platinum prices. It is important to note that the prices for these coins may move up or down based on the gold market. Orders may also be placed using the Mint’s toll free number 1-800-USA-MINT (872-6468). Hearing and speech-impaired customers may place orders and inquiries through TTY at 1-888-321-MINT (6468).